The Furniture Design Program is a wood-based program that focuses on the design and construction of furniture and functional objects within the context of contemporary culture. It integrates creative and technical processes necessary to build objects with structural logic and visual relevance. Introduction to Furniture Design: hand tools, joinery, machines. Intermediate Furniture Design: turning, bending, veneering, cabinetry. Advanced Furniture Design I: other materials (steel, aluminum, fiberglass, plastics). Advanced Furniture Design II: chair design and ergonomics. 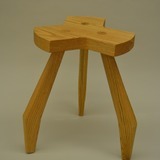 Furniture Design Portfolio: senior project. The Furniture Design facilities are currently housed in Briggs Hall and include a machine room, bench room, and glue-up area. Machines include: table saw, 2 band saws, jointer, planer, disk sander, mortiser, 2 lathes, scroll saw, 2 drill presses, bench grinders, mini mill, and vacuum bag system. Access to the sculpture studio is permitted and encouraged for non-wood processes. In this course, students acquire a working knowledge of Furniture Design. Techniques commonly used in Furniture Design are explored through the creation of projects ranging from functional to sculptural. Topics and techniques may vary; these may include, but are not limited to, joinery, turning, bending, veneering, design aesthetics, finishing, and production.